“Ghostbusters” stars Melissa McCarthy, Kristen Wiig, Kate McKinnon and Leslie Jones. Photo Credit: Columbia Pictures. When the cast was announced for the long-awaited next film in the Ghostbusters franchise, some short-sighted fans were upset that the Ghostbuster team would not star the original cast but would be played by female actors in what seemed like a gimmick. All of these criticisms were entirely speculative however, as director Paul Feig and the hilarious female cast deliver a comical and unique spin on a beloved franchise, yet still manage to pay the appropriate respect to the original films without it feeling like a copy. Ghostbusters opens in an old Manhattan mansion, where a guide (Zach Woods, Silicon Valley, 2016) is leading a tour through the house and describing the history including how the owner’s daughter had murdered a number of people in their sleep. After the tour concludes, he is startled by strange sounds and movements in the basement. When he goes to investigate, he is ultimately attacked by the girl’s ghost. The house’s owner pays a visit to Erin Gilbert (Kristen Wiig, Martian, 2015) a physics professor at Columbia University, who had written a book earlier in her career stating her belief in ghosts and her scientific theories regarding paranormal activity. Erin, who is trying to hide her interest in paranormal activity from the faculty as she is up for tenure, first denies that she wrote the book, but ultimately cannot hide that her face is on the dust jacket. She discovers that the book is now appearing online again despite her attempts to remove any trace of it. Erin heads over to the run-down laboratory of her old friend and the book’s co-author Abby Yates (Melissa McCarthy, The Boss, 2016) who she believes is responsible for the book remerging. Abby resents Erin for abandoning her work and has not given up on their dream of chasing ghosts with her new partner, Jillian Holtzmann (Kate McKinnon, Saturday Night Live, 2016), an engineer/scientist who looks and acts more like a mad scientist. Abby refuses to take the book off of the Internet, but when Erin tells her about the ghost at the mansion, Abby agrees to take the post down in exchange for going with her to see the haunted house. While heading over to the house, Erin is hesitant and skeptical of them seeing a ghost, but quickly becomes a believer again when the ghost appears and hilariously projectile vomits green slime all over her. Despite the sliming, Erin joyously confirms that ghosts are real in a video filmed by Jillian. Unfortunately, that clip quickly makes the rounds all over the Internet and winds up getting her fired from her lofty post at Columbia. Abby and Jillian convince Erin to look on the bright side as they have confirmed their earlier work and team up to scientifically prove that ghosts are real. The ladies who now have their own office (above an old Chinese restaurant) start to believe there is something else causing the rise in ghost sightings, especially after meeting with an observant subway worker, Patty Tolan (Leslie Jones, Saturday Night Live, 2016), who encountered a strange man, Rowan, (Neil Casey in his film debut) saying very bizarre things right before a ghost attacked her in the subway tunnel. Patty, who is armed with street smarts, joins their team, and the newly formed Ghostbusters expand their investigations, even hiring the very attractive but dimwitted Kevin (Chris Hemsworth, X, 2016) as their secretary. After discovering that Rowan is contributing to the ghost attacks, the team hunkers down to get to the bottom of his motive and prepares to save New York City. Ghostbusters is certainly an amusing movie that will delight fans, old and new. Devoted fans will surely enjoy the many cameos made by past characters. The film will also entertain fans who have never seen the original films because the jokes and story completely stand on their own merits, and the nods to the old film do not feel forced or distract from the narrative. The cast’s chemistry is on point and the four female leads each bring different comedic styles to the movie that generates laughs. Wiig plays the sometimes timid leader of the group who has a number of hilarious social miscues, especially with Hemsworth’s character. McCarthy plays more of a level-headed character compared to what audiences would expect from her in past films. She still shows she is one of the leading comedic actors, however, working with a number of funny lines. Current SNL cast members Kate McKinnon and Leslie Jones, who lack the film credits of Wiig and McCarthy, are hilarious nonetheless and steal a number of scenes in the movie. One standout scene occurs when Jones is thinking about the slimy ghost that hitched a ride on the subway; she states as she rolls her eyes, “I guess that ghost is going to Queens and he’ll be the third scariest thing on that train!” The chemistry between the girls (Ghostbusters) is energetic and just plan fun, their improv work experience shows through unequivocally. The movie is not without its flaws, however, as Hemsworth’s character, Kevin, is written to be too dumb, and it gets old fast. The movie could have also spent less time on action and special effects geared for 3-D crowds and more time developing the characters of the four talented actresses. Despite these flaws, Feig should be commended for his solid job of rebooting a comedy classic, which was a formidable challenge after more than 30 years. Similar to his most popular work directing Bridesmaids, Feig, once again, showed Hollywood how funny women can be when given the opportunity. Bottom Line? 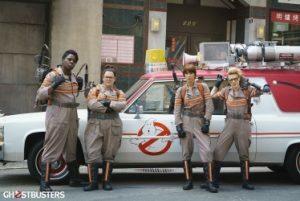 The fab four main cast members including McCarthy, Jones, Wiig, and McKinnon prove skeptics wrong in director Paul Feig’s rendition of Ghostbusters. Adults and children will enjoy this action-comedy in theaters, but parents may want to keep their children away (10 and under) who may be scared of the ghosts.